Most business litigation cases settle. But if your lawyer cannot go to trial, you get a bad settlement. In trial, clear and direct presentations win, while confusing and verbose presentations lose. Nevertheless, I see lawyers go into court with skimpy visual persuasion, trying to win by adding more talking. The reality is, people are visual. “Blah, blah, blah” neither captivates the jury nor interests the judge. Compared to criminal trials, civil trials are boring. There is no blood. There is no violent conflict. There is a contract to interpret. In the past, well-prepared trial lawyers relied on big enlargements of documents, charts and photographs, mounted on foam-core board. Big paper enlargements are still useful, because they can be left propped up and visible all the time. But often when the trial starts, the plan changes. “No plan of operations extends with certainty beyond the first encounter with the enemy’s main strength.” – Helmuth von Moltke, a Prussian strategist of the 19th century. When opposing counsel departs from your expectations, it is hard to edit your big paper enlargements to respond to some brand new attack. Corrections to pre-printed exhibits can take a day or two that you may not have. Trial is a competition. To win you use trial-specific technology to enlarge and display documents and photographs in the courtroom. Exhibits must be shown to be effective. The efficient way to do this is with trial presentation software. Business presentation software, e.g. PowerPoint, is for business meetings. Trials are much more adversarial than business meetings. In trial, your presentation must change, during the trial. The trial presentation software I have used lately is TrialSmart. It runs on Apple computers. It is so easy to use, that you do not have to use a technology assistant to run the program. Highly recommended. 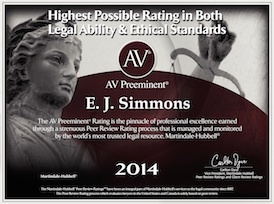 For a recent arbitration, TrialSmart was a big time-saver. It had been a few months since the last time I needed to use TrialSmart, but I was able to quickly get the exhibits into the correct folder on the computer, re-learn how to put up each exhibit on the screen, and re-learn how to magnify just the relevant part of the document to a big, easy-to-read insert. 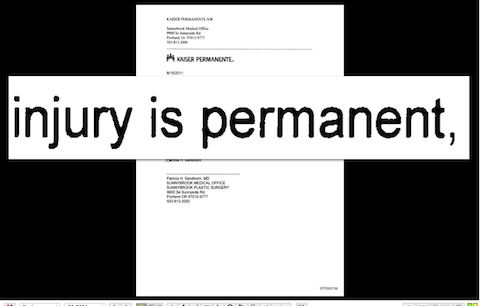 The letter (pictured above) contained the point, but showing the magnified quote emphasizes the three relevant words. Everyone remembers what you magnify and this is much better than using a yellow highlighter on a foam-core paper enlargement. Note that the magnified part of the document is not displayed by itself. It is shown in front of the full page, still visible behind the magnified part. Leaving the full image visible in the background has an important effect: it eliminates a potential adverse emotional reaction. It is comforting to see where you got the quote. Leaving the entire image context up as background is a major differentiator between using PowerPoint, and using trial presentation software such as TrialSmart. PowerPoint cannot do this, which is why you need trial software. The TrialSmart program runs on an Apple computer, typically a MacBook Pro or MacBook Air. If you want to use a Windows computer, the leading trial presentation software programs are Sanction and Trial Director. I own a copy of Sanction; I like Sanction. I prefer TrialSmart. TrialSmart is easy to use, easy to manage the exhibits on the notebook computer, and easy to show the exhibits on the screen to the fact finder. Also, Mac computers tend to be generally easier to use. Only a few business disputes go to trial, see the post with Judge’s comment about lack of trial experience of some lawyers. But when a business case goes to trial, the visual presentation can tip the outcome. Endless talk about a contract is boring to the jury, boring to the judge, almost puts me to sleep and I am being paid to listen. When you follow your opponent’s bunch of talking by putting up an image, everyone perks up, out of desperation for visual stimulation. Disclaimer: past victories are not a guarantee of future victory. Each case is different. call E. J. Simmons at 503-221-2000 to set up a consultation about your case.